Sculptured ceramic fish have tails formed to left or right - so they 'swim' through grasses, perennials and ground covers, creating motion and excitement in your garden. Start with a group of three - two tails one way and one tail the other way - and add as many as you like to form a colorful shoal of fishes in motion. 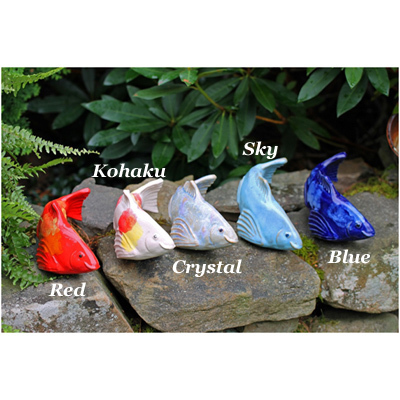 These colorful and delicate looking ceramic fish are made in Maine from sturdy stoneware clay and fired to around 2,200 degrees Fahrenheit, a process that makes them able to withstand even Maine's subzero winter temperatures. Steel stakes (included), pass through the bottom hole of the hollow fish and wedge securely inside the top fin, so the fish stays at the angle you choose to suggest movement and flow by the group of 3 or more. Artist designer Tyson Weiss, who designs and makes these fish, says: One is a fish on a stick. Two is cute and romantic. Three and more will create the flow." EXACT DIMENSIONS AND GLAZE COLORS WILL VARY DUE TO THE NATURE OF THE FIRING PROCESS. MINOR IMPERFECTIONS MAY ALSO OCCUR. EACH FISH IS UNIQUE, AS IN NATURE. I have fish swimming in my liriope and they are wonderful. One medium salsa and five salsa and kohaku mixed. The two colors look wonderful together. Fish are larger overall than just the length would indicate. 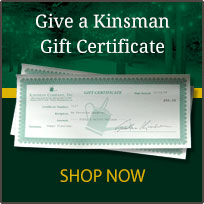 Very, very pleased with the order and the customer service at Kinsman. The quality is incredible. They look great in the garden. The service amazing. My chipped fish was replaced within a week!